I just attended the 1st US edition of the Collision conference in New Orleans. A 3 days marathon of start up pitches and product demos, talks by founder, developers, media execs and investors. I focused my time mostly on keynote sessions to get a good feel for tech and media tends. Here is what I captured. All these topics were definitely highly discussed but I’d rather share fresh new insights that I haven’t heard much about before. VR was at the center of many many, many conversations. Every company, every start up seems to be involved in some way or another. It is like we are recreating the invention of the moving image but instead of doing it over 100 years, it is happening in 3 to 5 years. The impact of VR on our lives, our social interactions, our empathy is (will be) huge. From the New York Times Displaced documentary covering the refugee crisis, to Charity water story telling, to Cirque du Soleil working on integrating VR into their shows, or recording important moments of our lives with the new Samsung VR camera being released next month…. VR is the next big thing. That is pretty obvious. What was interesting at Collision conference was to hear about what will happen when VR is here, at scale. For instance, imagine a VR experience with voice recognition, space tracking, hand movements and personal data all in one. This is a good transition to the next insight. If we are going to create robots and attempt to enhance human genetics and physiological functions, we need to solve ethical questions that didn’t need to be asked before. I started to think about that at SXSW where I saw a few engineers giving presentations that we were closer to philosophy than technology. Right now we know 2 stages of life “alive” and “not alive. So where do robots fit in and how we define their missions in society? Andrea Keay, Managing Director of Silicon Valley Robotics has endless knowledge and opinion about that. Here is one of her previous keynote. What about the fascinating applications that Halo Neuroscience will have not only on sport performances but learning, education, medicine… how can the device be used without aggravating inequalities? Is it pushing the limits of the human conditions? As you can sense, the Collision conference was a great experience. After 3 days of hyper stimulation, my brain was ready for some relaxing rhythm at NOJazzfest. India was the last (but certainly not least) stop on my Asia tour. A fascinated market where media transformation is waiting to explode with the arrival for 4G network, accessible and available for everyone. Will “in view ads” become the new benchmark for digital media? We have argued over auto refresh, video auto play, post view… here comes “in view ads”. I sense that ad verification is to be the next debate on the digital media industry and I’d like to get your opinion on this trending topic! From what I have heard so far agencies and media owners will fundamentally disagree: Clients will push for “verified impressions” to become the main currency of online measurement and delivery, whereas publishers will want to protect the monetization of all types of ad supply across their networks. So, let’s be clear “ ad verification” is a system that ensures every ad impression is a quality impression, every impression is compliant, and every ad was served and displayed exactly as intended. Basically a way to control that not only the ads are served in the right environment to the right audience but that they are actually viewed! Please help me build an informed opinion, share your thoughts & experience on the topic! A selection of my favorite campaigns from the 2011 Cyber Lions Awards. Why I like: Because it gave me goose bumps when I types my old address in Paris. Not all ads do that! Why I like: Becaue the fact that this campaign poped up a million time on my Facebook news feed illustrates how good this content is! There were a lot of other good campaigns in the Cyber Lions winners like the Mini gateaway Stockholm , the Decode Jay-Z with Bing (Titatium winner)… but some outstanding digital work was also delivered through cross platform campaigns. Most, if not all of you (at least in Australia) have seen the NAB break up campaign (PR Grand Prix winner), the Home Plus in Korea (media Grand Prix winner) is also a brilliant retail mobile campaign. What were your favorite ad campaigns last year? I met someone who invents the future! If you would meet Elizabeth Churchill, you would want to know all she knows! Elizabeth is a Senior Research Scientist in the Internet Experiences Group at Yahoo! and she knows a lot of things you want to ask questions about! In a very simplistic way, what Elizabeth and her team do at Yahoo! Labs, is analysing all sorts of data and known human behaviour to understand what triggers reactions to situations. Based on this understanding scientists are able to find out what would best suit our needs, apply this to technology and invent products that we will want to use in the future! In reality, it is far more complex and involves a lot of research, statistics, predictive modelling, testing and engineering… but you get the idea! They have also invented Yahoo! Zync, a prototype plug in that allows you to watch videos together with your friends, in sync and in real time. Instead of just IMing URLs and waiting for your friends to watch, Zync allows you to converse about a video (pausing, jumping back, and watching together with a friend). Both videos stay in sync. So, to all, like me who were convinced that IM had been killed by Facebook chat… Think again, this type of tool has high “usefulness” (not usability)… and from an advertiser’s standpoint, the engagement metrics are through the roof! Elizabeth is originally a doctor in psychology; her recent focus has been insights into social media, emerging digital media and the shifting landscape of people and groups that make up internet life. Some of her core beliefs about the future of digital are around the social psychology of trust and the notion that we are social not networked! The social psychology of trust highlights the very fine line between content being relevant to creepy! With system like OAuth we have stepped into a world where our data travels with us from device to device; it allows us to get access to very personalized information until that information gets slightly too personalized (or put in the wrong context) and we totally lose the trust we had in a platform. This will have high implication in the future for behavioral target and single sign on! It suddenly gives you a different perspective when an academic scientist talks about digital and social media, doesn’t it? If you are interested in reading more, a number of Elizabeth’s research studies can be found here. A few months ago Vivaki – a strategic entity of combined Publicis Group agencies including ZenithOptimedia – released the results of a large scale research project about online video advertising conducted out of the USA. The objectives of the research project were to identify the impact of online video advertising and build learnings around the multiple opportunities available. The project took over 16 months to complete, studied 29 different models and involved 25 million consumers. The key findings were the outstanding results of Ad Selector – which was identified as the best model for online video advertising, one that works for both advertisers and consumers! 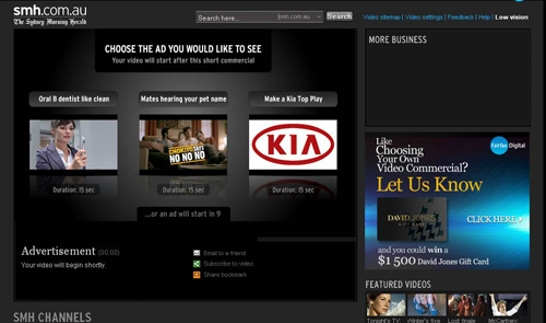 The ad selector is a new video ad unit (initially rolled out by Hulu) that gives the user the ability to choose the ad they want to watch: amongst 3 proposed ads, the user clicks on their selected one before launching their video experience and starting a pre roll. In Australia, Fairfax Digital was the first publisher to launch this format (soon to be followed by Youtube) and Nestle was one of the first three advertisers to test it with the Chokito says No, No, No campaign. As per the USA survey the initial results for this new ad unit are very encouraging: Completion rate of the Nestle Chokito TVC through the “ad selector” is over 13% higher than campaign average! We are already adopting it as a standard format. Let’s see how quickly the Australian market takes it up!